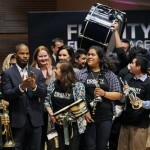 Jamie Foxx at the national Fidelity FutureStage music program kickoff in Los Angeles, Tuesday, Feb. 9, 2010. 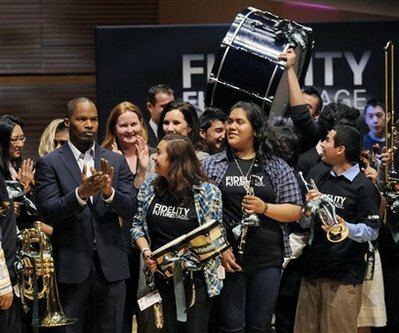 *Jamie Foxx helped present new violins, flutes, French horns, trumpets and drums valued at $500,000 to students from 16 schools nationwide as part of the Fidelity FutureStage program, an effort by the investment firm to enrich arts education in public schools. Founded in 2006, the program provides instruments, specialized training by professional musicians, and a chance for aspiring artists to perform with renowned orchestras such as the Los Angeles Philharmonic and Boston Pops, reports the AP. The event was held Tuesday at the Walt Disney Concert Hall in downtown, Los Angeles, the backdrop of Foxx’s recent film “The Soloist.” Actor Dominic Monaghan hosted the program, which was simulcast in Boston, Houston, Chicago and Los Angeles. Students in all four cities performed and received donated instruments. Foxx, 42, told students he played classical piano as a teen and eventually earned a scholarship to study the instrument in college. Foxx poses with students from Renaissance Arts Academy in Los Angeles who had just received new musical instruments. After the program, Foxx praised Fidelity for stepping in where public funding had failed. He also encouraged other companies to participate. 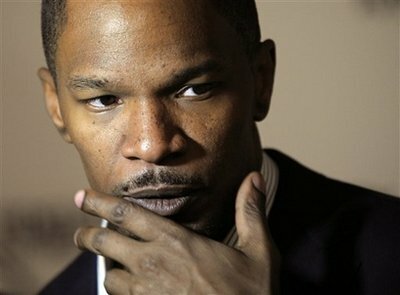 “Even if a kid is not going to be the greatest musician in the world, just the fact that you gave him something, the fact that you said, ‘hey, I care about you,’ that’s what it’s about,” Foxx said. That was a very nice gesture Jamie. I know the schools appreciate waht you have done. It was nice that he was there to help “present” all these wonderful instruments, but HOW MUCH MONEY DID HE DONATE?? ?